Start from Hanoi to discover two fascinating countries Vietnam and Cambodia. Visit and taste the street food at Hanoi old quarter and experience the overnight cruise on Halong bay. Spend your time on beach in one of the most beautiful bay Nha Trang. Your journey ends with an unforgettable exploration of the Angkor Wat complex in Cambodia. Have an entirely wonderful holiday in Vietnam and Cambodia. Diverse array of city attractions in hidden lane and alleys at Hanoi old quarter. Refresh between wonderful natural landscapes of Halong Bay. Relax on golden sand beach in Nha Trang. Explore the highlighted sites in Ho Chi Minh city. Discover the farming life, and fruit gardens in the immense Mekong Delta. Admire Angkor Wat and Angkor Thom in Siem Reap. Upon arrival, tour guide and driver of S Vietnam Travel will welcome you. Tour briefing and transfer to city centre. After a short break, you will begin the city tour with interesting places: Temple of literature - the first university of Vietnam, One Pillar pagoda and one of the city museum (Vietnamese Women museum or Vietnam History museum). In the late afternoon, enjoy walking tour around Hoan Kiem lake and the Old Quarter of Hanoi. Enjoy a welcome dinner at the local restaurant hosted by S Vietnam Travel. At around 8 am, your driver will pick you up for the journey to Halong Bay and arrive at around midday to board a traditional junk for an overnight cruise. Halong Bay is widely considered to be one of the natural wonders of the world. Thousands of towering pillars of sea and wind-carved limestone karst make the bay an unforgettable sight. After lunch, explore some of the huge limestone caves dotted around the bay and visit a floating fishing village. Then the captain will find a secluded spot where you can swim, soak up the sun on the top deck, or try your hand at kayaking. In the evening enjoy a seafood feast for dinner. Enjoy an early morning swim (during the summer), followed by breakfast as you cruise through more spectacular scenery. The cruise arrives at the harbor by noon. The driver will pick you up and then transfer directly to the airport for flight to Nha Trang. Upon arrival in Nha Trang, you will be transferred to your hotel in city centre. You have 3 full free days in Nha Trang. You have two full days to enjoy the beach. A lot of suggestions for your holiday such as: Take a boat trip of the coast of Nha Trang and enjoy diving or snorkeling to admire the coral reef as well as the array of beautiful fish in the water. Visit some interesting places in the downtown. Start at the Cham Tower -- an ancient shrine and temple built by the erstwhile ruling Cham people. Nearby is Long Son pagoda, where you can climb up to a majestic sitting Buddha and take in the scenic views over Nha Trang city. From the summit, you should be able to spy your next stop, the Oceanographic Institute. Housed in a huge complex of old French colonial buildings, the Institute is an interesting place to stroll around, not least for some of the gruesome exhibits. Think big glass jars and vinegar. You will catch morning flight to Saigon. Upon arrival in Saigon - Vietnam’s largest city, you will have a half day tour including the interesting sites such as The Reunification Palace, Notre Dame Cathedral and Old Post Office, Remnant War Museum and Ben Thanh market. Today, you will discover Mekong delta and visit the colorful floating market - Cai Be. Leave bustling Saigon for the 3 hour drive to the delta town of Cai Be. On arrival, board your boat for cruise in the Delta’s waterways. After a delicious lunch at the local ancient house, you will have chance admire the scenery and the daily life of the local villagers by rowboat passing through small sampan. Stops on the way can be made upon request for particular visits or photos marking. The excursion will end at around 3.00 pm. You will return to Saigon in the later afternoon. Today, you will fly to Siem Reap. Upon arrival in Siem Reap, brief itinerary and transfer to city centre. After a short break, start your tour to the incredible temple Ta Prohm. There are enormous fig trees and gigantic creepers which embrace themselves in the stone foundations of the structure giving the impression of man's creation being reclaimed by the powerful forces of nature. You also explore the grand circuit with Preah Khan, Kravan, Neak Pean, Krol Ko, Ta Som, East Mebon and Pre Rup Temples, where you can enjoy the sunset. Enjoy welcomed dinner at the local restaurant. Following the breakfast at your hotel, you have a full day to explore the wondrous ancient ruins with the South Gate of Angkor Thom, which is famous for its series of colossal human faces carved in stone, the impressive Bayon Temple, the Royal Enclosure, Phimeanakas, the Elephant Terrace, the Terrace of the Leper King and the largest as well as the most complete temple of Angkor Wat. This architectural masterpiece was constructed in the 12th century and covers an area of about 210 hectares. You stroll around this massive edifice, seeing the many galleries with columns, libraries, pavilions, courtyards and ponds full of water reflecting the towering temple. Breakfast at the hotel then visit the Grand Fresh Water Lake (Tonle Sap Lake) - Kampong Phluk. It is about 20 km southeast of Siem Reap and it is a group of three villages of stilted houses built within the floodplain of the Tonle Sap .The villages are for the most part Khmer and have about 3,000 inhabitants between them. Flooded mangrove forest surrounds the area and is home to a variety of wildlife including crab-eating macaques. Transfer to the airport for the flight departure. Note: Please be aware that hotels and all other logistics, services and days of travel are subject to availability. If the listed hotel is fully booked, alternate accommodation will be offered. All hotels are rated according to local standards. All itineraries are flexible and can easily be altered to suit your needs and interests. Contact one of our travel consultants for more information. S Vietnam Travel can organize any additional accommodations. Accommodation based on twin/double sharing with daily breakfast (3* hotel category). Experienced English-speaking guides as indicated in the itinerary. 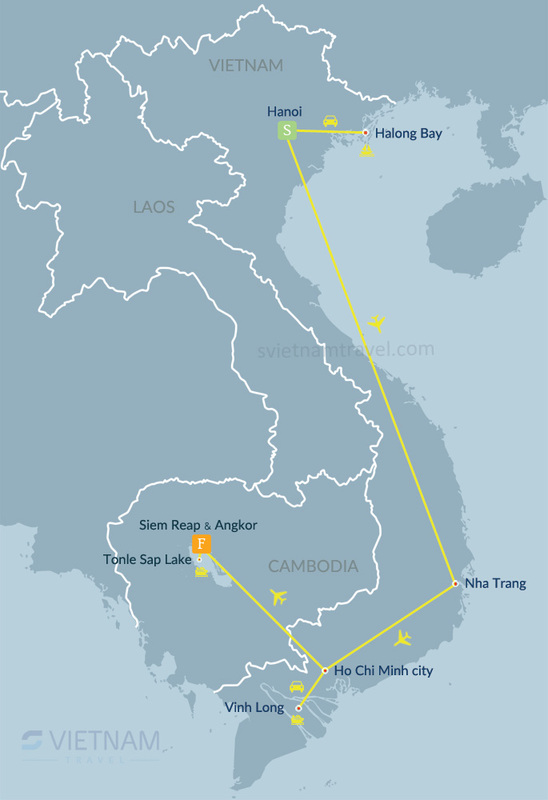 Flight tickets Hanoi - Nha Trang, Nha Trang - Saigon, Saigon - Siem Reap. Lunches and dinners as indicated in the itinerary. International flight tickets and airport tax. Early check in and late check out. Drinks, gratuities and personal expenses. The tour rate is based on twin/double sharing rooms at 3* hotel category. We can customize this tour according to your request. Our travel consultant will contact you within 12 hours with a tailor-made itinerary and price. A minimum deposit of 30% of the full amount is required to confirm your booking. The balance will be settled before or upon arrival. 30 days before arrival: No cancellation charge. 29 - 14 days before arrival: 10% of the tour cost is forfeited. 13 - 7 days before arrival: 40% of the tour cost is forfeited. 6 days before arrival: 100 % of the tour cost is forfeited. No show: 100% of the tour cost is forfeited. This tour is easy for you to manager the flight schedule, will start in Hanoi (the capital of Vietnam) and finish in Cambodia (the capital of Cambodia). Our team will help yo.. This trip immerses you in two distinct cultures travelling from Vietnam to Cambodia. You have chances to discover a lot of highlights from the miracle natural heritage Ha..
How to book this tour? Final tour itinerary and rate. Settle the balance when arrival. Tailor made & flexible itinerary. Free Vietnam visa approval letter. VietnamandCambodiaTours.com is a premium tour booking service offered by S Vietnam Travel. International Tour Operator Licence No: 01-1170/2018/TCDL-GPLHQT. Issued by Vietnam National Administration of Tourism. Hanoi Vietnam Head Office: Suite B12, Level 4, Sun Ancora Building, 3 Luong Yen Street, Hanoi, Vietnam. 12th Floor, Viettel Building, 12 Ward, 10 District, Ho Chi Minh city, Vietnam. Group 27, Phum Taphul, Sangkat Svaydongkum, Siem Reap, Cambodia. 77 Mano Street, Luang Prabang, Laos. No 26/A, Ground Floor, Thirizayar Street, Zawana, Thingangyun Township, Yangon, Myanmar.